Polling has begun for four Lok Sabha and ten assembly by-elections across the country on Monday, the results of which could control the tone and tenor for the 2019 general elections for the Bharatiya Janata Party (BJP) and the opposition. All eyes will be on Kairana Lok Sabha constituency in Uttar Pradesh, where a joint opposition will take on the BJP. The opposition hopes to repeat the success of the Gorakhpur and Phulpur by-elections in March in which the ruling BJP suffered unexpected defeats. Kairana, around 630km from Lucknow, has five assembly segments and an electorate of nearly 1.7 million with a significant number of Muslims, Jats and Dalit voters. The constituency fell vacant after the death of BJP parliamentarian Hukum Singh, whose daughter Mriganka Singh is the party’s candidate for the bypoll. She is up against the Rashtriya Lok Dal’s (RLD) Tabassum Hasan, who is supported by the Congress, Samajwadi Party and the Bahujan Samaj Party. RLD supporter Abdul Hakeem Khan said he had never seen an election in which a combined opposition has challenged the ruling party. “This is the beauty of our democracy,” he said. The BJP is trying to retain the seat and send a message to voters, party cadre as well as the opposition parties that the drubbing in Gorakhpur and Phulpur was an aberration. RLD candidate Hasan said “both Hindus and Muslims live in peace” in Kairana. BJP’s Mriganka Singh said: “The exodus of Hindu families from Kairana has stopped now. But hundreds of Hindu families had fled Kairana out of fear and harassment before the 2017 UP Assembly elections”. Apart from Kairana, bypoll to Noorpur assembly constituency in the state will be held on Monday. The votes will be counted on May 31. The focus of political parties and pundits will also be on the by-elections to Palghar and Bhandara-Gondia Lok Sabha seats in Maharashtra. The Shiv Sena has fielded late BJP MP Chintaman Wanaga’s son Shriniwas Wanaga in Palghar, much to the dislike of the BJP which has nominated Congress deserter Rajendra Gavit. In a veiled attack on the BJP, Shiv Sena chief Uddhav Thackeray called upon opposition parties to unite. “I want to tell the Congress, the NCP, even communists, don’t go separate ways … let’s come together to fight the calamity which has befallen the country,” he said at a campaign rally. Congress spokesman Ratnakar Mahajan said the results will be a “fresh mandate” on the performance of the Narendra Modi government. “The outcome of the bypolls will lead to new political alignments. There will be a new vigour in the anti-BJP camp if the ruling party loses both seats,” he said. The BJP is confident of retaining the two seats. Union minister Smriti Irani and Uttar Pradesh chief minister Yogi Adityanath campaigned there. 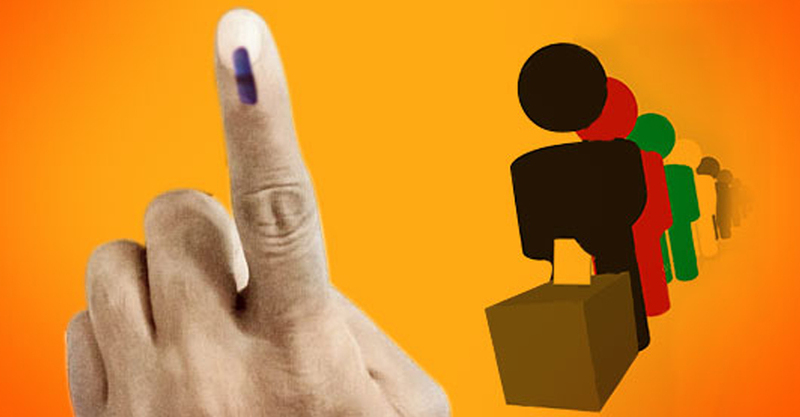 The fourth Lok Sabha bypoll will be held in Nagaland. The by-election was necessitated after the Nationalist Democratic Progressive Party (NDPP) leader Neiphiu Rio, now chief minister of Nagaland, resigned as a Lok Sabha member in February. It will be a test of strength between the candidate of the Naga People’s Front (NPF) supported by Congress and the nominee of the ruling People’s Democratic Alliance (PDA). The PDA, which has the NDPP and the BJP as it major constituents, has fielded former minister Tokheho Yepthomi in the seat. This apart, there will bypolls to five assembly seats in as many states in the eastern region. The five seats are Maheshtala in West Bengal, Gomia and Silli in Jharkhand, Jokihat in Bihar and Ampati in Meghalaya. The bypoll to Mahestala assembly seat in West Bengal will mainly witness a three-cornered contest with the ruling Trinamool Congress, the BJP and the Left Front in the fray. In Meghalaya’s Ampati seat, the fight is mainly between the Congress and the BJP-backed National Peoples Party. The Congress won 21 seats in the February assembly polls, but the count came down to 20 with Sangma vacating the seat. “Winning the Ampati seat could bring about changes in the political scenario in the state as the Congress will become the single largest party,” party leader John Kharshiing said. The NPP with 19 MLAs is leading a coalition government. Bypolls will be held in Punjab’s Shahkot, Uttarakhand’s Tharali and Kerala’s Chengannur assembly constituencies.